Michelangelo di Lodovico Buonarroti Simoni (Italian: [mikeˈlandʒelo]; March 1475 – 18 February 1564), was an Italian sculptor, painter, architect, poet, and engineer of the High Renaissance who exerted an unparalleled influence on the development of Western art. Considered to be the greatest living artist during his lifetime, he has since also been described as one of the greatest artists of all time. Despite making few forays beyond the arts, his versatility in the disciplines he took up was of such a high order that he is often considered a contender for the title of the archetypal Renaissance man, along with contemporary rival and fellow Florentine Medici client, Leonardo da Vinci. Two of his best-known works, the Pietà and David, were sculpted before the age of thirty. 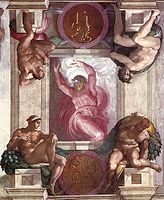 Despite his low opinion of painting, Michelangelo also created two of the most influential frescoes in the history of Western art: the scenes from Genesis on the ceiling of the Sistine Chapel in Rome, and The Last Judgment on its altar wall. As an architect, Michelangelo pioneered the Mannerist style at the Laurentian Library. At the age of 74, he succeeded Antonio da Sangallo the Younger as the architect of St. Peter's Basilica. 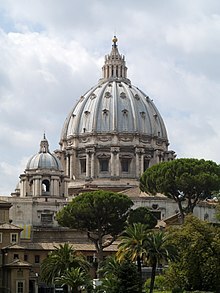 Michelangelo transformed the plan,with the western end being finished to his design, and the dome being completed after his death, with some modification. In his lifetime he was also often called Il Divino ("the divine one"). 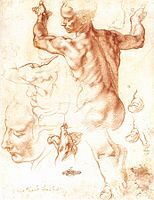 One of the qualities most admired by his contemporaries was his terribilità, a sense of awe-inspiring grandeur, and it was the attempts of subsequent artists to imitate Michelangelo's impassioned and highly personal style that resulted in Mannerism, the next major movement in Western art after the High Renaissance. The city of Florence was at that time the greatest centre of the arts and learning in Italy. Art was sponsored by the Signoria (the town council), by the merchant guilds and by wealthy patrons such as the Medici and their banking associates. The Renaissance, a renewal of Classical scholarship and the arts, had its first flowering in Florence. In the early 15th century, the architect Filippo Brunelleschi had studied the remains of Classical buildings in Rome and created two churches, San Lorenzo's and Santo Spiritu, which embodied the Classical precepts. The sculptor Lorenzo Ghiberti had laboured for fifty years to create the bronze doors of the Baptistry, which Michelangelo was to describe as "The Gates of Paradise". The exterior niches of the Church of Or' San Michele contained a gallery of works by the most acclaimed sculptors of Florence – Donatello, Ghiberti, Andrea del Verrocchio, and Nanni di Banco. The interiors of the older churches were covered with frescos (mostly in Late Medieval, but also in the Early Renaissance style), begun by Giotto and continued by Masaccio in the Brancacci Chapel – both of whose works Michelangelo studied and copied in drawings. During Michelangelo's childhood, a team of painters had been called from Florence to the Vatican, in order to decorate the walls of the Sistine Chapel. Among them was Domenico Ghirlandaio, a master in fresco painting, perspective, figure drawing, and portraiture. He had the largest workshop in Florence, at that period. In 1488, at the age of 13, Michelangelo was apprenticed to Ghirlandaio. The next year, his father persuaded Ghirlandaio to pay Michelangelo as an artist, which was rare for someone of fourteen. When in 1489, Lorenzo de' Medici, de facto ruler of Florence, asked Ghirlandaio for his two best pupils, Ghirlandaio sent Michelangelo and Francesco Granacci. From 1490 to 1492, Michelangelo attended the Humanist academy which the Medici had founded along Neo-Platonic lines. At the academy, both Michelangelo's outlook and his art were subject to the influence of many of the most prominent philosophers and writers of the day including Marsilio Ficino, Pico della Mirandola and Poliziano. At this time, Michelangelo sculpted the reliefs Madonna of the Steps (1490–1492) and Battle of the Centaurs (1491–1492). The latter was based on a theme suggested by Poliziano and was commissioned by Lorenzo de Medici. Michelangelo worked for a time with the sculptor Bertoldo di Giovanni. When he was seventeen, another pupil, Pietro Torrigiano, struck him on the nose, causing the disfigurement which is conspicuous in all the portraits of Michelangelo. Lorenzo de' Medici's death on 8 April 1492 brought a reversal of Michelangelo's circumstances. Michelangelo left the security of the Medici court and returned to his father's house. 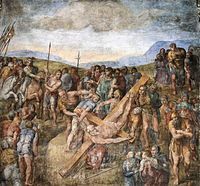 In the following months he carved a polychrome wooden Crucifix (1493), as a gift to the prior of the Florentine church of Santo Spirito, which had allowed him to do some anatomical studies of the corpses of the church's hospital. Between 1493 and 1494 he bought a block of marble, and carved a larger than life statue of Hercules, which was sent to France and subsequently disappeared sometime c. 18th century. [c] On 20 January 1494, after heavy snowfalls, Lorenzo's heir, Piero de Medici, commissioned a snow statue, and Michelangelo again entered the court of the Medici. In November 1497, the French ambassador to the Holy See, Cardinal Jean de Bilhères-Lagraulas, commissioned him to carve a Pietà, a sculpture showing the Virgin Mary grieving over the body of Jesus. The subject, which is not part of the Biblical narrative of the Crucifixion, was common in religious sculpture of Medieval Northern Europe and would have been very familiar to the Cardinal. The contract was agreed upon in August of the following year. Michelangelo was 24 at the time of its completion. It was soon to be regarded as one of the world's great masterpieces of sculpture, "a revelation of all the potentialities and force of the art of sculpture". Contemporary opinion was summarized by Vasari: "It is certainly a miracle that a formless block of stone could ever have been reduced to a perfection that nature is scarcely able to create in the flesh." It is now located in St Peter's Basilica. 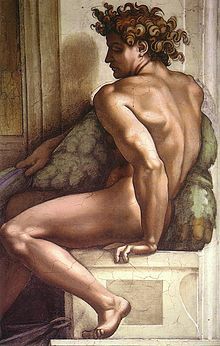 Michelangelo returned to Florence in 1499. The republic was changing after the fall of anti-Renaissance priest and leader of Florence, Girolamo Savonarola, (executed in 1498) and the rise of the gonfaloniere Piero Soderini. He was asked by the consuls of the Guild of Wool to complete an unfinished project begun 40 years earlier by Agostino di Duccio: a colossal statue of Carrara marble portraying David as a symbol of Florentine freedom to be placed on the gable of Florence Cathedral. Michelangelo responded by completing his most famous work, the statue of David, in 1504. The masterwork definitively established his prominence as a sculptor of extraordinary technical skill and strength of symbolic imagination. A team of consultants, including Botticelli and Leonardo da Vinci, was called together to decide upon its placement, ultimately the Piazza della Signoria, in front of the Palazzo Vecchio. It now stands in the Academia while a replica occupies its place in the square. With the completion of the David came another commission. In early 1504 Leonardo da Vinci had been commissioned in the council chamber of the Palazzo Vecchio depicting The Battle of Anghiara between the forces of Florence and Milan in 1434. Michelangelo was then commissioned to paint the Battle of Cascina. The two paintings are very different, Leonardo's depicting soldiers fighting on horseback, and Michelangelo's showing soldiers being ambushed as they bathe in the river. Neither work was completed and both were lost forever when the chamber was refurbished. Both works were much admired and copies remain of them, Leonardo's work having been copied by Rubens and Michelangelo's by Bastiano da Sangallo. Also during this period, Michelangelo was commissioned by Angelo Doni to paint a "Holy Family" as a present for his wife, Maddalena Strozzi. It is known as the Doni Tondo and hangs in the Uffizi Gallery in its original magnificent frame which Michelangelo may have designed. He also may have painted the Madonna and Child with John the Baptist, known as the Manchester Madonna and now in the National Gallery, London, United Kingdom. 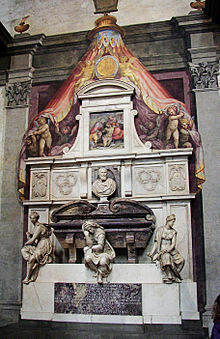 Under the patronage of the Pope, Michelangelo experienced constant interruptions to his work on the tomb in order to accomplish numerous other tasks. Although Michelangelo worked on the tomb for 40 years, it was never finished to his satisfaction. It is located in the Church of S. Pietro in Vincoli in Rome and is most famous for the central figure of Moses, completed in 1516. Of the other statues intended for the tomb, two known as the Rebellious Slave and the Dying Slave, are now in the Louvre. The composition stretches over 500 square metres of ceiling, and contains over 300 figures. At its centre are nine episodes from the Book of Genesis, divided into three groups: God's creation of the earth; God's creation of humankind and their fall from God's grace; and lastly, the state of humanity as represented by Noah and his family. On the pendentives supporting the ceiling are painted twelve men and women who prophesied the coming of Jesus; seven prophets of Israel and five Sibyls, prophetic women of the Classical world. 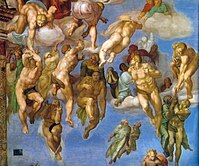 Among the most famous paintings on the ceiling are The Creation of Adam, Adam and Eve in the Garden of Eden, the Deluge, the Prophet Jeremiah, and the Cumaean Sibyl. In 1520 the Medici came back to Michelangelo with another grand proposal, this time for a family funerary chapel in the Basilica of San Lorenzo. Fortunately for posterity, this project, occupying the artist for much of the 1520s and 1530s, was more fully realized. Michelangelo used his own discretion to create its composition of the Medici Chapel. It houses the large tombs of two of the younger members of the Medici family, Giuliano, Duke of Nemours, and Lorenzo, his nephew, but it also serves to commemorate their more famous predecessors, Lorenzo the Magnificent and his brother Giuliano who are buried nearby. The tombs display statues of the two Medici and allegorical figures representing Night and Day, and Dusk and Dawn. The chapel also contains Michelangelo's Medici Madonna. In 1976 a concealed corridor was discovered with drawings on the walls that related to the chapel itself. Pope Leo X died in 1521, to be succeeded briefly by the austere Adrian VI, then his cousin Giulio Medici as Pope Clement VII. In 1524 Michelangelo received an architectural commission from the Medici pope for the Laurentian Library at San Lorenzo's Church. He designed both the interior of the library itself and its vestibule, a building which utilises architectural forms with such dynamic effect that it is seen as the forerunner of Baroque architecture. It was left to assistants to interpret his plans and carry out instruction. The library was not opened until 1571 and the vestibule remained incomplete until 1904. In 1527, the Florentine citizens, encouraged by the sack of Rome, threw out the Medici and restored the republic. A siege of the city ensued, and Michelangelo went to the aid of his beloved Florence by working on the city's fortifications from 1528 to 1529. The city fell in 1530 and the Medici were restored to power. Michelangelo fell out of favour with the young Alessandro Medici who had been installed as the first Duke of Florence, and fearing for his life, he fled to Rome, leaving assistants to complete the Medici chapel and the Laurentian Library. Despite Michelangelo's support of the republic and resistance to the Medici rule, he was welcomed by Pope Clement who reinstated an allowance that he had previously made the artist and made a new contract with him over the tomb of Pope Julius. In Rome, Michelangelo lived near the church of Santa Maria di Loreto. It was at this time that he met the poet, Vittoria Colonna, marchioness of Pescara, who was to become one of his closest friends until her death in 1547. 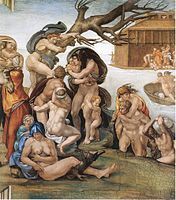 Shortly before his death in 1534 Pope Clement VII commissioned Michelangelo to paint a fresco of The Last Judgement on the altar wall of the Sistine Chapel. His successor, Paul III was instrumental in seeing that Michelangelo began and completed the project. 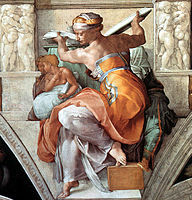 Michelangelo labored on the project from 1534 to October 1541. The fresco depicts the Second Coming of Christ and his Judgement of the souls. Michelangelo ignored the usual artistic conventions in portraying Jesus, and showed him a massive, muscular figure, youthful, beardless and naked. He is surrounded by saints, among which Saint Bartholomew holds a drooping flayed skin, bearing the likeness of Michelangelo. The dead rise from their graves, to be consigned either to Heaven or to Hell. Michelangelo worked on a number of architectural projects at this time. They included a design for the Capitoline Hill with its trapezoid piazza displaying the ancient bronze statue of Marcus Aurelius. 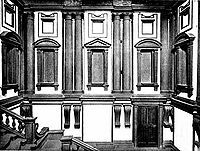 He designed the upper floor of the Palazzo Farnese, and the interior of the Church of Santa Maria degli Angeli, in which he transformed the vaulted interior of an Ancient Roman bathhouse. Other architectural works include San Giovanni dei Fiorentini, the Sforza Chapel (Capella Sforza) in the Basilica di Santa Maria Maggiore and the Porta Pia. The Madonna of the Steps is Michelangelo's earliest known work. It is carved in shallow relief, a technique often employed by the master-sculptor of the early 15th century, Donatello and others such as Desiderio da Settignano. While the Madonna is in profile, the easiest aspect for a shallow relief, the child displays a twisting motion that was to become characteristic of Michelangelo's work. The Taddeo Tondo of 1502, shows the Christ Child frightened by a Bullfinch, a symbol of the Crucifixion. The lively form of the child was later adapted by Raphael in the Bridgewater Madonna. The Bruges Madonna was, at the time of its creation, unlike other such statues which show the Virgin proudly presenting her son. Here, the Christ Child, restrained by his mother's clasping hand, is about to step off into the world. The Doni Tondo, depicting the Holy Family, has elements of all three previous works: the frieze of figures in the background has the appearance of a low-relief, while the circular shape and dynamic forms echo the Taddeo Tondo. The twisting motion present in the Bruges Madonna is accentuated in the painting. The painting heralds the forms, movement and colour that Michelangelo was to employ on the ceiling of the Sistine Chapel. The kneeling angel is an early work, one of several that Michelangelo created as part of a large decorative scheme for the Arca di San Domenico in the church dedicated to that saint in Bologna. Several other artists had worked on the scheme, beginning with Nicola Pisano in the 13th century. In the late 15th century, the project was managed by Niccolò dell'Arca. An angel holding a candlestick, by Niccolò, was already in place. Although the two angels form a pair, there is a great contrast between the two works, the one depicting a delicate child with flowing hair clothed in Gothic robes with deep folds, and Michelangelo's depicting a robust and muscular youth with eagle's wings, clad in a garment of Classical style. Everything about Michelangelo's angel is dynamic. Michelangelo's Bacchus was a commission with a specified subject, the youthful God of Wine. The sculpture has all the traditional attributes, a vine wreath, a cup of wine and a fawn, but Michelangelo ingested an air of reality into the subject, depicting him with bleary eyes, a swollen bladder and a stance that suggests he is unsteady on his feet. While the work is plainly inspired by Classical sculpture, it is innovative for its rotating movement and strongly three-dimensional quality, which encourages the viewer to look at it from every angle. In the so-called Dying Slave, Michelangelo has again has utilised the figure with marked contraposto to suggest a particular human state, in this case waking from sleep. With the Rebellious Slave It is one of two such earlier figures for the Tomb of Pope Julius II, now in the Louvre, that the sculptor brought to an almost finished state. These two works were to have a profound influence on later sculpture, through Rodin who studied them at the Louvre. The Bound Slave is one of the later figures for Pope Julius' tomb. The works, known collectively as The Captives, each show the figure struggling to free itself, as if from the bonds of the rock in which it is lodged. 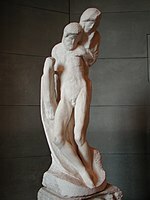 The works give a unique insight into the sculptural methods that Michelangelo employed and his way of revealing what he perceived within the rock. The composition of the Battle of Cascina, is known in its entirety only from copies, as the original cartoon, according to Vasari, was so admired that it deteriorated and was eventually in pieces. It reflects the earlier relief in the energy and diversity of the figures, with many different postures, and many being viewed from the back, as they turn toward the approaching enemy and prepare for battle. 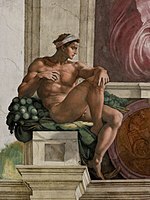 ↑ 1,0 1,1 ha1,2 "Michelangelo biography", Encyclopædia Britannica. ↑ 2,0 ha2,1 Michelangelo. (2008). ↑ Peter Barenboim, Sergey Shiyan, Michelangelo: Mysteries of Medici Chapel, SLOVO, Moscow, 2006. ↑ 46,0 ha46,1 A. Condivi (ed. ↑ "Michelangelo 'last sketch' found", BBC News (7 December 2007). Retrieved on 9 February 2009. ↑ Crucifixion by Michelangelo, a drawing in black chalk. ↑ 57,0 57,1 ha57,2 Condivi, The Life of Michelangelo, p. 106. ↑ Hughes, Anthony, "Michelangelo", page 326. ↑ Scigliano, Eric: "Michelangelo's Mountain; The Quest for Perfection in the Marble Quarries of Carrara", Simon and Schuster, 2005. ↑ 62,0 62,1 ha62,2 Hughes, Anthony: "Michelangelo", p. 326. ↑ Rictor Norton, "The Myth of the Modern Homosexual", p.143. ↑ Vittoria Colonna, Sonnets for Michelangelo. Kemmoù diwezhañ degaset d'ar bajenn-mañ d'an 29 Gen 2019, da 04:20.